Welcome to the last Digital Digest of the "official" spring season! We're here once again with all of your usual news (hopefully some of which is true news to you), a look ahead at Tuesday's releases, and reviews! This week, we've got a double feature for reviews (and we will have plenty more double features for the summer months), with reviews of Scandal - The Complete First Season and Rocko's Modern Life - Season Three. Let's get going! We absolutely love Warner Archive for always bringing us so much positive news in a time where other studios are bringing gloom and doom when it comes to DVDs, and just this past Tuesday, they treated us to an unexpected surprise (although it was much less of a surprise if you've been reading their Facebook page or our edition of Digital Digest from two weeks ago!) as they released Alice - The Complete First Season (read our review). The good news this month doesn't stop with Alice, though! With the chaos of this sudden release, something else that has been discussed much less is the release of the sixth season of Night Court, which we first told you about in December. We knew it would be coming, but yesterday, we got a very pleasant surprise as Pavan, our reviewer for releases of the series, unexpectedly received a copy of Night Court - The Complete Sixth Season! The set is not slated to be available to order until June 26, but we have it now... so expect a review of the set very soon. "Your comment earlier today on HTF was fairly accurate. Your wisdom is commendable." In other words, Warner Archive is now doing a limited run on some of their multi-disc sets as pressed DVDs, which are highly preferred over the standard DVD-R media typically used for MOD offerings! We can confirm that both Alice and the soon-to-be-released Night Court are using pressed discs (for now, at least), and although we did not review the set, apparently Without a Trace - The Complete Third Season is also using pressed DVDs for early orders. Warner Archive has not really addressed why they are doing this, but considering that they are doing this primarily for multi-disc releases, it is likely due to the fact that releases receive the most publicity when they are first announced, and having a supply of pressed DVDs ready to be shipped is preferable (and likely more economically feasible) to burning multiple copies as they are ordered. In any event, we hope that Warner Archive keeps this up, and we would love to see them try to continue this model beyond just the earliest batches! "This is under consideration for mass-market release, pending resolution of outstanding clearance matters." Now, we certainly encourage readers to be cautious with that bit of information, because it suggests that the DVDs are most likely not in the physical production phase right now, and a lot can happen between now and an actual release. But the great news here is that the series is under serious consideration, and if it makes it to DVD, it could actually be available from regular retail outlets. Of course, we don't expect an announcement on this any time very soon (and just to be clear, we may never hear an announcement on it if clearance issues are too challenging to clear), but it is great to know that the series is at least on the radar. Finally last week, we discussed the Sony MOD title Emily's Reasons Why Not - The Complete Series potentially missing an entire episode. It had appeared that a seventh episode existed, "Why Not to Look in Bridal Magazines," which appeared to have aired in some countries... but this episode is not included in the set. However, the online information regarding international airings of this episode were completely incorrect. Upon posting our review, we found out some information relayed directly to an author of an upcoming book of episode guides of short lived series, from series producer Alicia Kirk regarding this "missing episode." Kirk informed the author that the episode was never produced. So, clearly it is very important to not always trust all of the information that you find online... but we hope that you'll trust this information! Tuesday (June 19) is not a particularly exciting day for releases, but there are two releases from Shout! Factory (neither of which we will be reviewing), with Hey Dude - Season Three and The Sarah Silverman Program - The Complete Series. Also, Lionsgate has Tyler Perry's House of Payne - Volume Nine, which we should have a review of soon. From the creator and executive producers of Grey's Anatomy and Private Practice comes a drama revolving around the life and work of a professional crisis manager and her dysfunctional staff. That show is ABC's new hit series Scandal! Now you can own the complete first season with all seven episodes on a two-disc DVD set! A former consultant to the President, Olivia Pope dedicates her life to protecting and defending the public images of America's elite. After leaving the White House, the power consultant opened her own firm, hoping to start a new chapter – both professionally and personally – but she can't seem to completely cut ties with her past. Slowly it becomes apparent that her staff, who specialize in fixing the lives of other people, can't quite fix the ones closest at hand -- their own. 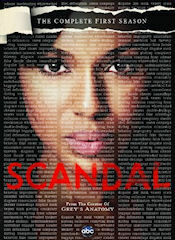 The first season stars Kerry Washington as Olivia Pope, Henry Ian Cusick as Stephen Finch, Columbus Short as Harrison Wright, Guillermo Diaz as Huck, Darby Stanchfield as Abby Whelan, Katie Lowes as Quinn Perkins, Tony Goldwyn as President Fitzgerald Thomas Grant III and Jeff Perry as White House Chief of Staff Cyrus Beene. However, there are many recurring stars such as Joshua Malina as David Rosen, Liza Weil as Amanda Tanner, Bellamy Young as Mellie Grant, Brenda Song as Alyssa, Brendan Hines as Gideon Wallace, and Matt Letscher as Billy Chambers. Kate Burton guest stars as Vice President Sally Langston. The series aired for the last seven weeks of the season and delivered solid and steady rating. The series generated buzz and acclaim, with trending topics on Twitter during every episode. Look for a bright future for this acclaimed series that will keep getting better, I think. Anyway, as for this set, there are many memorable episodes in this suspenseful juicy series. All seven episodes are a must see and is easy to watch. You should be done with every episode in like five hours. So catch up or start today as season two will start in the Fall on Thursday nights! The series starts off with the episode "Sweet Baby," where young lawyer Quinn Perkins is in awe when she becomes part of Olivia Pope and Associates, a crisis management designed to protect and defend the public images of the nation's elite by keeping their secrets safe, and works alongside her idol Olivia Pope – a woman who is willing to help her clients whatever the cost may be. The series really starts to get ramped up in "Enemy of the State," as the Amanda Tanner case takes a shocking turn that leaves Cyrus looking into Olivia's personal life along with some of her fellow associates, as Olivia and the rest of the team deal with a kidnapping while Quinn has dinner with a reporter. In "Crash and Burn," a commercial plane crashes and the only survivor is the pilot, so Pope and Associates must defend the pilot from accusations at every corner, while Huck uses his past connections to find a client that has gone missing. In "The Trail," Gideon intensifies his investigation into the Amanda Tanner case and in doing so finds a connection between Olivia Pope and the Grant when he was running for office. And on the shocking season finale, "Grant: for the People," Quinn finds herself in a serious problem and only Olivia can help her, while Cyrus also requires Olivia's help after a possible blow to Grant's credibility. The DVD comes in a case held by an outer thin box. The thin outer box is in black with a facial shot of Olivia Pope and has scandalous words written all over with leaves the series logo at the bottom and the complete first season mention is on the top. The back of the thin outer box has info on the set and series, with a nice quote from the New York Times. We have a nice cast photo as well. There is also a box showcasing the bonus features as well. When we remove the outer box, we get to the case. The case has the same artwork as the thin box, both cover and back, so everything is the exact same. Inside the case we have a cool cast photo on the panels itself. There is also a disc-by-disc breakdown below the cast photo on the panels listing episode titles per disc. As for the discs themselves, disc one is on a little plastic holder that you can flip like a page in a book. Disc two is on the right panel itself, though. It should have been on the back of the plastic holder, I think. Both discs are in the black design with the series logo in red and a nice design in the background that is different for each disc (Olivia and scandalous words on disc one and the Capitol Building on disc two). Disc one holds episodes 1-4, while disc two holds episodes 5-7. There is also an insert booklet showcasing other ABC TV DVDs that are coming soon like Once Upon a Time and Revenge, and it is placed on the left panel. The menu design is great! We first have a shot of the Capitol, then the White House, then we see clips from the series playing in the background as we have background music from the show playing. Before the main menu, we have auto trailers. On disc one we have trailers for Castle Season 4, ABC TV DVDs coming this summer and fall, and the upcoming theatrical Odd Life of Timothy Green. Disc two has trailers for more ABC TV on DVD and Who Framed Roger Rabbit 25th Anniversary Blu-ray. Back to the main menu, the options are: Play All, Episode Selection, Bonus Features, Set Up and Sneak Peeks. Sneak Peeks is only on disc two and has the same trailers as the auto trailers on disc two. Set Up gives us the option for subtitles in English, French, Espanol, and Portuguese. You can also register your DVD here. Bonus Features is just on disc two and lists what is available, while Episode Selection gives us an episode number and title. Video and audio quality are both outstanding, similar to other recent ABC TV DVDs we have reviewed like The River. We have Digital Dolby 5.1 surround sound and it is perfect. For the video, we are in widescreen (1.78:1), enhanced for 16x9 televisions. It is excellent quality but that is expected for newer/current series. As I keep saying, if anything goes wrong with audio/video for current series, then there is a major problem. Each episode has 8 or 9 chapter stops, so it is easy to jump through an episode if you are looking for something in particular, like that steamy scene between Olivia and the President--viewer discretion advised, indeed! There are some special features on this set as well! They are all on disc two. First up, another is the featurette "Scandal: Setting the Pace" (18:06). This insightful piece allows fans to meet the cast of the show as they share their experiences playing such interesting roles and working on a show. It's a very good and informative featurette and has interviews with Shonda Rhimes (executive producer), Judy Smith (co-executive producer), Betsy Beers (executive producer), Kerry Washington, Columbus Short, Tony Goldwyn, Jeff Perry, Katie Lowes, Guillermo Diaz, and Darby Stanchfield. Then we have a second featurette and this one is called "Gladiators In Suits: Casting A Series" (6:25). In this exciting piece, audiences have a chance to hear how the production chose just the right actor for each role. This also includes a look at screen tests and seeing the actors' excitement upon learning the news that they'd been cast in the show. Katie Lowes is so innocent and cute! Interviewed are Shonda Rhimes, Katie Lowes, Henry Ian Cusick, Betsy Beers, Judy Smith, Columbus Short, and Kerry Washington. And finally we have "Scripting Scandal" (7:29). The series has storylines that are both riveting and topical. In this piece, fans will meet the show's writers and their inspiration, Judy Smith, who Olivia Pope is based on. Also included is the process of writing such a compelling show. Interviewed here are Shonda Rhimes, Heather Mitchell (co-producer/writer), Richard E. Robbins (executive story editor/writer), Jenna Bans (co-executive producer/writer), Matt Byrne (writer), Mark Wilding (executive producer/writer), and Judy Smith. This is a nicely done set for a nicely made show. Talk about a quick turnaround! The series just aired its season finale on May 17 and this DVD is released on June 12! You have all summer to watch all seven episodes and be hooked by the time the second season starts in late September on ABC Thursdays. The series just got better and better, and juicer and juicer. Look for some Emmy nominations, I bet, especially Kerry Washington and Jeff Perry. As for the DVD, it is well done and similar to previous ABC TV DVDs. We get great audio/video, menus, packaging and special features. I think the features are adequate for something with only 7 episodes. Three featurettes! I wish we had deleted scenes and audio commentaries though, like The River DVD had. My only other real gripe was for disc two placement in the packaging, but that is not a big deal. ABC Studios knows how to make good DVDs, especially for their current series. I urge you to try this show. If you only watched the pilot or one more episode, you need to watch them all. It is very well written and acted. It's the new West Wing, Shonda Rhimes style! So be gladiator in suits, and buy this DVD, people (as Olivia would say)! 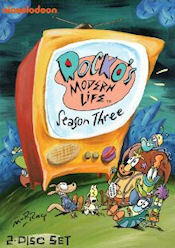 Rocko, Spunky, Heffer, and Filburt are back on DVD once again for 13 more episodes of Rocko's Modern Life on DVD! The classic Nicktoon from the '90s may not be the most famous of all of the Nicktoons, but it was certainly one of the best ones (and in my opinion, stands a bit above the other ones even). Created by Joe Murray, the series follows an immigrant wallaby from Australia trying to make it through "modern life" in America... but nothing ever quite goes as expected for him as he has to deal with his own problems, the problems of his friends, and of course, his neighbors, the Bigheads. As is the case with most Nicktoons, the series usually aired in two separate segments in a half hour block (although occasionally, there would be a "two-part" episode which covered both halves of the episode). So, most of the "episodes" that we talk about are actually just 12 minute segments (although there is one in this set which is a full 25 minute episode). The set begins with "Bye, Bye, Birdie," where Rocko and Heffer have to bird sit with Filburt's bird Turdy when Filburt is sick, but just as his name suggests, Turdy is not a particularly pleasant bird. Rocko has some plumbing trouble (thanks to Heffer) in "Belch of Destiny." In "Schnit-Heads" (a very interesting episode title for a Nickelodeon series), Heffer becomes a member of a "sausage club," so hopefully they won't send him any beef sausage. Filburt tries to come out of his shell for Halloween in "Sugar Frosted Frights." Rocko suspects foul play from the Bigheads when he thinks that Bev murdered Ed in "Ed is Dead: A Thriller!" Heffer and Filburt make a bit of an X-rated video when they videotape Rocko sleepwalking naked in "Camera Shy." In "Old Fogey Froggy," Ed has a midlife crisis, and tries to recapture his youth by hanging out with Heffer, Rocko, and Filburt. Ed's bug problem becomes Rocko's bug problem in "Rocko's Happy Vermin." In "I See London, I See France," Rocko and Heffer go all the way to France... but experience absolutely nothing that they wouldn't experience at home. In "Dear John," Rocko's kitchen suffers a bit of a setback from a government satellite collapse. Rocko and Heffer get into a big fight, and find themselves trying to resolve it on tabloid TV talk circuit in "Speaking Terms." In the double-length episode"Wacky Delly," Rocko, Heffer, and Filburt make it big into show business. Filburt finds the woman of his dreams (or so he thinks) in "The Big Question," which results in wedding chaos in "The Big Answer." In "Scrubbin' Down Under," Rocko's hygeine becomes a big deal (nationwide) after his "spinach tooth" is revealed. An exciting (and extravagant) recycling program comes to O-Town in "Zanzibar." The season ends with "Fatal Contraption," where Rocko buys a food processor which ends up processing him more than it processes food. Once again, creator Joe Murray worked with Shout! Factory to create customized package artwork for this set, and it is definitely very excellent work. The cover art has a photo of the entire cast standing in front of a TV with the series logo on the TV, with a brief description of the season and a photo of Rocko on the back of the case. The set is packaged in a standard DVD case with a tray in the middle to hold one of the discs. You'll also find a listing of episodes, along with descriptions, inside of the case. There are two discs, with episodes 1-7 on Disc 1 and episodes 8-13 on Disc 2. There is a photo of Rocko on Disc 1, and a photo of Filburt on Disc 2. The menus on the set are very basic, with a listing of all of the episodes (along with a photo of Rocko and Heffer) on the main menu. Both segments for each episode are listed on the menu, so you can start the episode from the middle segment if you wish. There is also a Play All option on the main menu. The closing theme music plays in the background of the menu. Chapters are placed appropriately throughout each episode. There really aren't any issues of concern with the video or audio quality of the episodes. Some of the contrast levels are a little off every now and then (sometimes too dark, sometimes too light), but it isn't too bad. In general, the episodes look just as they did on Nickelodeon. The stereo audio track doesn't really use many special effects, obviously, but it is very loud and clear. Each episode contains closed-captioning. This is another decent release of the series, and it is great to see more contributions from Joe Murray on here. His insights on this set really were much more, well, "insightful" on this set, and were even better than the previous ones. It is difficult to really come up with a plethora of special features for this set, so I think what is included really does do the job. It is hard to believe that this series is only one season away from completion, and I'm hopeful that we will see a release of that season soon, maybe even with a few surprise special features on it. But for now, you can enjoy the thrills of "modern life" with these thirteen episodes. Mel's Diner (www.alicehyatt.com) - We would be "going through life with blinders on" if we didn't include a website for the series Alice as our Click of the Week this week, and we do just that with the website Mel's Diner. There aren't too many website for the series out there, but Mel's Diner fills that void with a very complete website for the series. You can find plenty of information about the the background of the series, the cast, the characters, and even some rarities such as details of the production schedule and the history behind Mel's cap just from the main page. There is also a brief episode guide (to replace that, well, non-existent episode guide not included in the DVD! ), a brief synopsis of each season, an overview of the movie which was the inspiration for the series, an overview of the spinoff Flo, and even a few episode scripts which you can read on the website. There is aslo a place to find some memorable quotes and some audio clips from the series. It certainly isn't a website which is all inclusive of everything you'd ever want to know about Alice, but it is a very nice and professional looking site which will get you cued in on all of the essential information which you need to know about the series... and perhaps, with the release of the DVDs, the site will gain more interest from fans and become bigger over time. Of course, if you want to see the first season after (or maybe even before), you can always find it on Warner Archive. And since this is our Click of the Week, you may find that things will work out and that you'll stay a while!